This workshop will explore and inspire the use of colour in ‘Double Knitting’ using the traditional patterns found in Operation Homespun. Newfoundland’s knitting industry is historically devoid of much colour. The traditional sheep’s white and grey has been replaced by colours easily accessible via Brigg’s and Little or McCauslands, but the availability of exciting new yarns hasn’t trickled down into the industry. This workshop will unlock the potential of the old patterns and open up the possibility of technicolour trigger mitts, socks, and hats. Colour palettes for knitwear that are inspired by the towns of their origin. It will also help inspire new designs in sweaters, vests and other garments for the Newfoundland Industry. During my time teaching around the province, I have found that many Newfoundland knitters are not comfortable with terms such as colour theory, design and motifs. 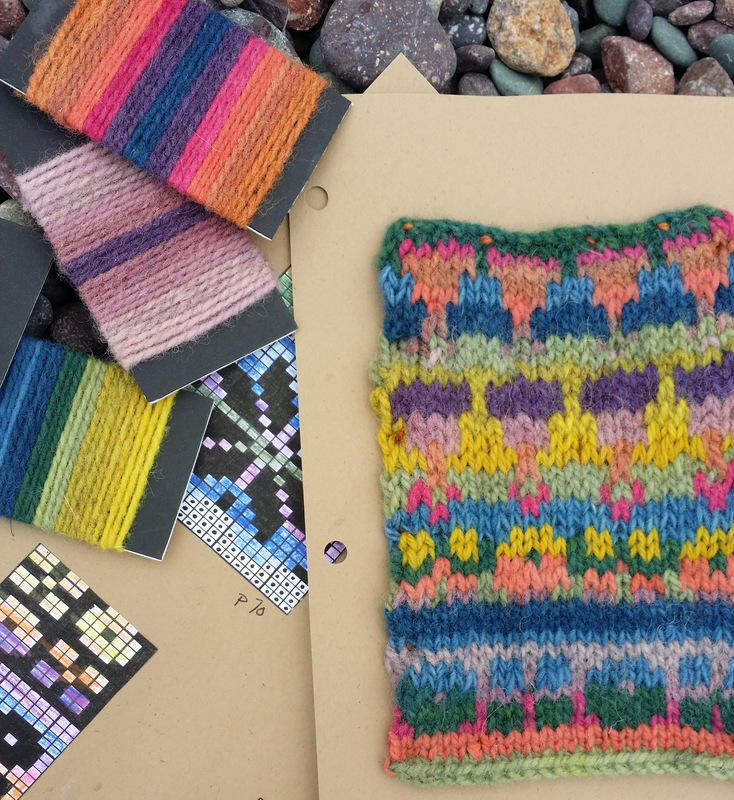 This work shop will use familiar terms and patterns to guide them through the process of understanding the colour theory of Fair Isle in a relaxed environment. Knitters will create a series of colour charts, swatches and motif variations that can be used to add colour to work that they are currently knitting. Swatches completed in the class will be discussed to determine why certain colour ways work and why others don’t, value and its effect on the motif, troubleshooting and bringing the created colour ways into existing patterns. This workshop will be useful for both entry level knitter and the seasoned professional. It would also be beneficial to knit designers or anyone else who would like to explore the theory of colour work and or the technical aspect of traditional Newfoundland double knitting. Susan is passionate about hand embroidery and natural fibres. She is committed to the time required to tell a story through hand stitching with colours created from nature. Susan works seasonally: summer and fall are a time to gather and dye materials, winter and spring are for stitching. Her studio is nestled in beautiful Conception Harbour, where she spends time traipsing through woods and over bogs, hunting for dye plants and interesting objects. Susan is also an instructor at the College of the North Atlantic’s Textiles Program. In 2010, she achieved Post Secondary Educator Certification with the province of Newfoundland and Labrador. Susan has taught natural dye and textile workshops throughout North America. She has many followers who enjoy her passion for textiles, as well as her casual teaching style. Susan’s award-winning textile creations can be found in collections around the world.